The Essence of the Ocean of Attainments (Dngos grub rgya mtsho’i snying po) is a commentary on the creation stage of the Guhyasamaja Tantra written by the illustrious Panchen Lama, Losang Chökyi Gyaltsen (1570–1662). The practice of Guhyasamaja, one of the earliest and most influential of the highest Tantras, along with its remarkable hermeneutic system, created a framework that was applied to other so-called unexcelled Tantras. Still very much a living tradition, in our time the Fourteenth Dalai Lama confers its empowerment every year. In this work, the Panchen Lama not only clarifies each step of the sadhana meditation ritual, but he also offers general insights into the practice and its workings. It is an Essence because it distills the much longer Ocean of Attainments commentary on the practice composed by Khedrup Jé (1385–1438), one of two key disciples of Tsongkhapa, the founder of Tibetan Buddhism’s Geluk school. The Panchen Lama identifies core elements of sadhana and with unparalleled precision clarifies many seminal points. 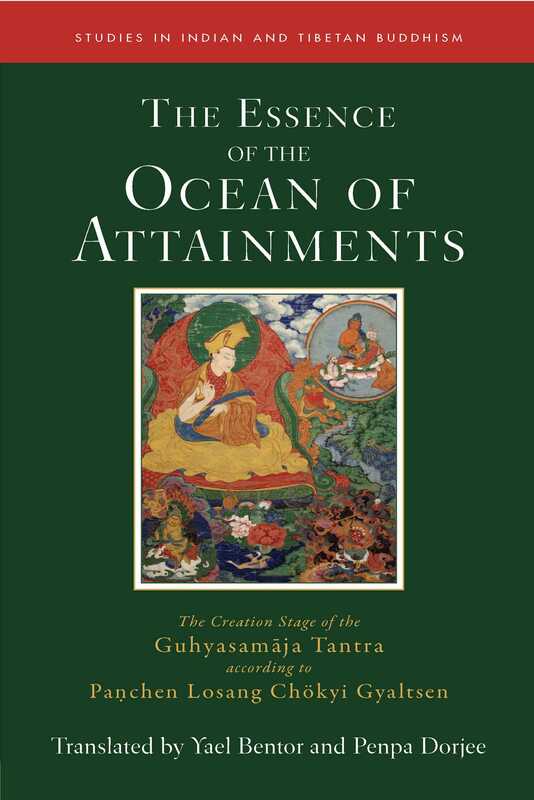 In her introduction, Yael Bentor surveys the creation stage of unexcelled Tantra as presented by the founding fathers of the Geluk school and unpacks the contents of The Essence of the Ocean of Attainments for readers. The translation features both explanatory annotations for practitioners and ample references for scholars. The eloquent and very clear explanations of the Guhyasamaja Sadhana by the famous teacher of the Fifth Dalai Lama, Pachen Losang Chökyi Gyaltsen, are a fine example of Geluk hermeneutics that skillfully combines a comprehensive knowledge of all relevant canonical sources with well-reasoned critical analysis. With their well-annotated translation of this fine piece of Tibetan scholarship, Yael Bentor and Penpa Dorjee have rendered an invaluable service to scholars and practitioners alike. It can be recommended even to newcomers to the field of tantric studies, given its detailed but straightforward introduction to the complex and fascinating system of generation- stage practice. The introduction also contains a range of interesting new information on the Gelukpa’s understanding of Tantra, such as Je Tsongkhapa’s statements to the effect that consorts can also be male or that female practitioners are able to attain complete awakening in their female bodies. "Contained in this volume is one of the very best introductions to the practice of the Buddhist class of the unsurpassed or unexcelled tantras. The authors, Profs. Yael Bentor and Penpa Dorjee, translated the first Panchen Lama Losang Chökyi Gyaltsen's (1570–1662) substantial summary of Kedrup Geleg Pelsangpo's (1385–1438) large discussion of the so-called generation stage of the Guhyasamaja Tantra as laid out in accordance with the *Arya transmission of the text. As Gelukpa commentators, Kedrup and the Panchen Lama owe a great deal to Tsongkhapa's (1357–1419) earlier interpretations of the Guhyasamaja Tantra and its attendant theoretical and practical literature. Bentor and Dorjee informed their outstanding translation of this difficult work with copious explanatory notes that are based on a very large corpus of primary and secondary literature. Theirs is an outstanding contribution to the field of Buddhist Studies in general and to the study of tantric Buddhism in particular. One can only hope that similar studies of this sterling quality will follow in its wake."